One of the main reasons I rebooted this blog was to help me work out what I should be doing with myself. I have a lot of individual goals, but no specific strategy on how to accomplish them. Right now I’m flailing around randomly, doing a bit here and a bit there, but not making much progress in any direction. This morning I sat here at my desk for thirty minutes and have nothing to show for it. Well, maybe that’s not entirely fair. I did take time to read WordPress’ suggestions on how to focus my blog. I figured there would be something relevant to me, since focusing on any one thing is next to impossible for me. Their solution? Make a set of mind maps that progressively focus you on what you’re interested in and want blog about. Did I do the exercise? Nope. I think I’ve got a pretty good idea of what I want to do on this blog. That said, I did sit here for 30 minutes before deciding to write about. Around new years my wife made me sit down and make a combined list of some of our goals for the next year. The goals fell into three distinct categories: Things to do around the house (make a tree house, shed, etc), travel (go to Alaska), and starting at least two new businesses. The latter is where I’ll focus for the remainder of this article. I really like being my own boss. It gives me the flexibility to work when and how I need to, with a few reasonable limitations. However, I’ve not been happy with the work I’ve been doing recently I and I feel that I need to move on to something else. This has become increasingly urgent to me. Most people who work with me would probably tell you that I have a panoply of ideas that I’ve worked on. 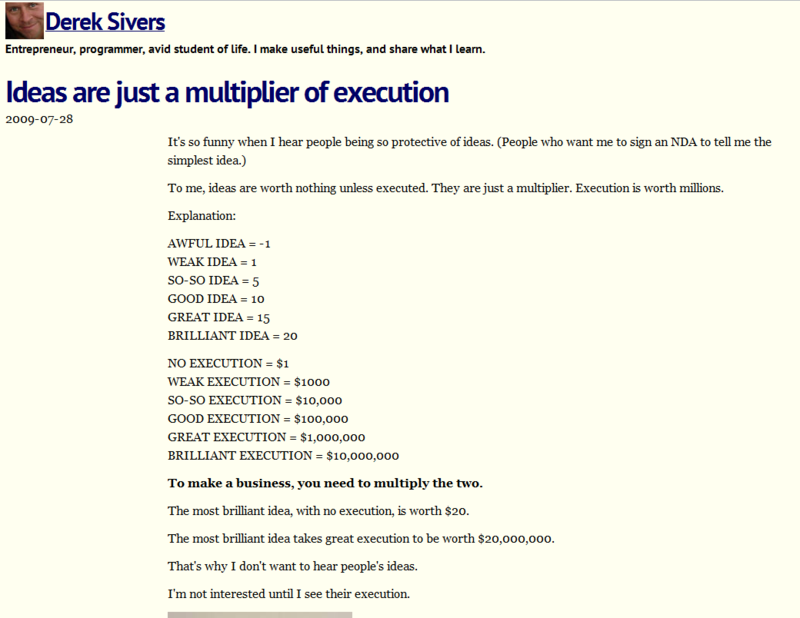 I can think of at least eight, nine, ten, eleven, twelve potentially viable ideas off the top of my head. I’ve already started work on five of them. My biggest problem here is distractibility and self doubt. I have at least two projects that are half done because I moved on to other projects that seemed that much more exciting, interesting and promising. And sometimes a project falls under the weight of self doubt. Another major challenge is that I’m primarily a technical person. I understand programming. So, I naturally gravitate towards technical problems. I draw mockups, write programs, make web pages, etc, for these ideas. But when it comes to the tedious or unfamiliar work, I fall down. For example, I’m not a marketing person. I really only have the faintest ideas on how to promote and sell most of these projects I’m working on. Why bother building something new if no one will ever see or use it? As an example, I released Pan Slam, an very simple iOS app last week. I’ve only sold 18 copies (mostly to friends) so far, which makes me wonder why bothered at all. If I knew better ways to promote it, I think I would. But it would be nice to work with someone else who knew what they were doing in this area and enjoyed doing it. I’ve come up with a long-shot solution to these problems. There is an awesome website called KickStarter. KickStarter describes themselves as, “the world’s largest funding platform for creative projects.” Essentially, the way it works is that if I want to raise funds for a project I can create a proposal to explain the idea, make supporting videos, and then essentially beg the KickStarter community, my friends, followers, and family for a specific amount of money for my project. If I raise the money I get it all, if I fail I get nothing at all. I have yet to submit any KickStarter proposals, but I did support KickSat, which was successfully funded! There are a few things I like about KickStarter. I love the all or nothing approach. If the my project is not supported then perhaps it’s not destined to be. However, if I succeed, then I have funds to pay for the parts of the project that I can’t do (well) myself. Essentially, KickStarter has the potential to tell me if I really have a good idea and give me the resources to accomplish it if I do. My latest idea is to throw ideas at KickStarter, one at a time, until one actually succeeds. I plan to become a guru of writing proposals and making videos to talk about my ideas! I’ll update the blog here as I decide which project I’m doing and as I learn more about working with KickStarter.